Caja de acero, de 41mm, mecanismo automatico, con fechador. Respaldo cristal de zafiro totalmente transparente. Disponible en cinta de piel, y broche doble. 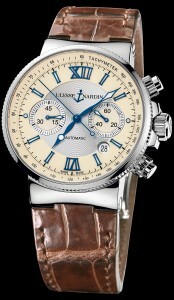 It is a 41mm, stainless steel case, featuring a chronograph, with an automatic, and a date indicator. It is a STUNNING two-tone, grey and ivory color dial, with the etched rotor with Ulysse Nardin name and anchor logo visible through the exhibition glass back. It is available on a brown leather strap, with a stainless steel folding buckle.